On arrival at Boreland Loch Tay on the Friday evening, I was cheerfully informed that there was a stag do and a 21st birthday party over the weeekend. Not our usual venue then. I assured the staff member that we were a mature, dull lot. Thankfully, the accommodation was so spread out over the hillside that we couldn’t hear the other guest revelling. And we didn’t wake them when three of our party had a 5:30 start. The forecast was not great: mild, windy, low cloud and no snow or ice. That didn’t put Claire H off. Chris Ro and Martha gamely joined her on an epic round of the Munros and Corbetts around Loch An Daimh. Nearly 30k and 9.45 hours of fun. In early January. Most of it in the dark. And they saw an ermine. They seemed a little disappointed to have had to bail on the last summit, but it was nevertheless an inspiring venture in the way that some of us never wish to be inspired. 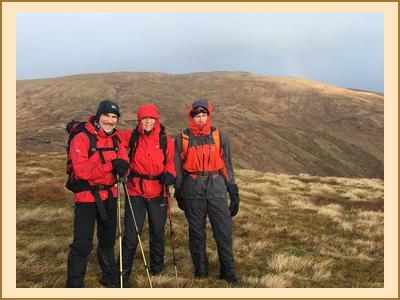 Despite very high winds on the Saturday, Gareth and Chris Wood managed an impressive tally of 4 Munros: Meall a Choire Leith, Meall Corranaich, Ben Lawyers and Beinn Ghlas. They reported crawling along the ridge so made the decision to not complete the traverse. Paul and the Renvilles went up Stuc an Lochain, Paul highly chuffed to be out again. Ken, Alison F, Perry, Kate, Allan S and I went up the Corbett Creagan an Beinne in two groups, both of which got lost in the farmland at the start. After a number of fence crossings, we took different routes and met at the top, and the sun even put in a brief appearance. Tim also ascended this hill plus Creag Uchdag and the intervening Graham of Shee of Ardtalnaig in a W formation with lots of height loss. Two more to his tally though. 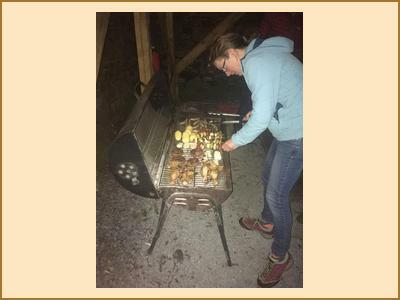 The BBQ on Saturday evening was excellent thanks to great team work and mild conditions. The bunkhouse was too hot to start the wood burner, most of us were in t shirts. On Sunday, the weather conditions were similar. Kate and Allan ascended Creag Uchdag and met Martha and Chris R at the summit. Gareth and Chris W did Schiehallion, Paul managed the four Munros in Glen Lyon, and Alan and Anne popped up Meall Ghaordaidh. Tim tackled more Corbetts, I don’t have the details but I imagine it was another significant outing. Alison, Ken, Perry and myself were rained on and decided to head home, and Claire did a low level 10 miles from Acharn on the south side of Loch Tay. She must have been feeling a tad tired. It was a good meet. Thanks everyone.